Yesterday, as we were debating over who is cooking so much, Cookies said, he wishes we had a good asian restaurant in the neighbourhood, cos he feels for egg rolls and sweet & sour chix… Unfortunately we don’t have even one. There are 5 or 6 places offering asian cuisine but none of them is actually edible. I think we got spoiled by Green Dragon ;P awesome food. Our debate reminded me that I haven't post anything oriental for very long time. 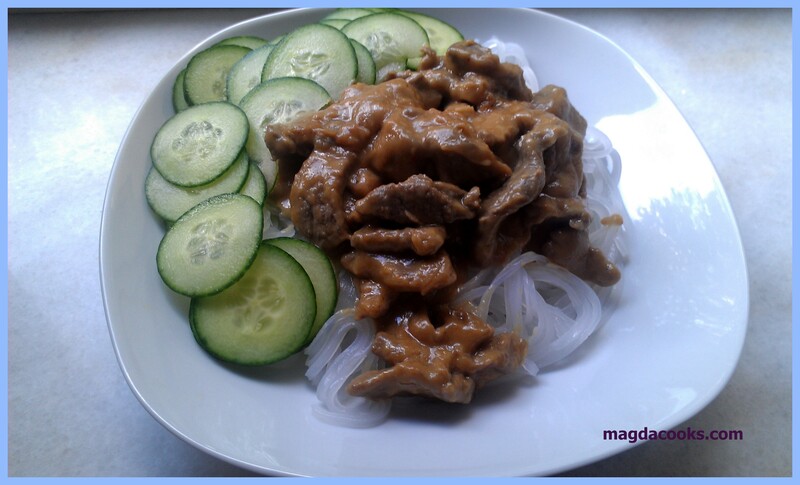 So I started browsing my archives and I found a picture of my variation on Beef Satay. As usual the recipe was easy, but when I started cooking I found out that I didn’t have skewers 0_o, so couldn't make it the exact way. My first thought was: dang no dinner today 0_o he will be moaning again, OK I have to do something to SHUT HIM UP! Though after hitting my head on the ledge for about 5 minutes I decided I will “variate” the recipe so it will fit what I have, why that took 5 minutes you ask, well I was knocked silly from hitting my damn head on the ledge, DUH. 0_o When I cooked and, I tried it I was again in great distress, cos when I tried it… it was at least a bit weird 0_o. though telling you, I thought it will be another spectacular disaster… but in the end… read Cookies comment :D.
Clean beef and slice it thinly against the grain. Using a teaspoon peel ginger and shred it, you should have around 2-2,5 tbsp. In a bowl mix in ginger, soy sauce, brown sugar, lemon juice and peanut butter. Whisk it good, until it’s smooth and creamy. Heat oil in the pan, toss beef and fry until meat gets a little browned. Add the mixture and keep boiling for another 5-10 minutes until meat is soft and your kitchen smells like nut heaven :D While you do that, cook noodles along the package instructions and set aside. Slice english cucumber. 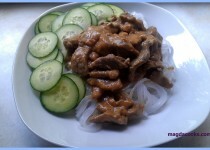 Put a portion of noodles on the plate, add good amount of meat and use cucumber slices as garnish. PS. Cookies thoughts: OK so, this meal was tempting… and very different, and while it has the dreaded (for some) PEANUT BUTTER! in it, I got to say this was incredible. No, not a case of FAVORITISM, as there is plenty of as she put it, SPECTACULAR DISASTERS, that I have endured, but this one CLEARLY is NOT one of them… give this one a SHOT, really… in the end, Magda Cooks… it just right… (literally and figuratively).